Photography by Andrea Massari and fashion by Andrea Gasser. Click for details. Handmade sunglasses by Ozona, leather jacket with Swarovski diamonds, artisanal By Fabrizio Talia. T-Shirt and belt by Covherlab, cape with fringe by Propaganda Noir, bag by Manui, socks by Calzedonia and hearling slippers stylist’s own. Necklace by Magnetic Balls, Tetramag, bra by Miu Miu, organza dress and belt by Covherlab. flats by Bloch. White dress by Covherlab and black dress With Swarovskiwith Swarovski diamonds, artisanal By Fabrizio Talia. White dress by Covherlab and black dress With Swarovskiwith Swarovski diamonds, artisanal By Fabrizio Talia. Dress by Covherlab and jacket stylist’s own. 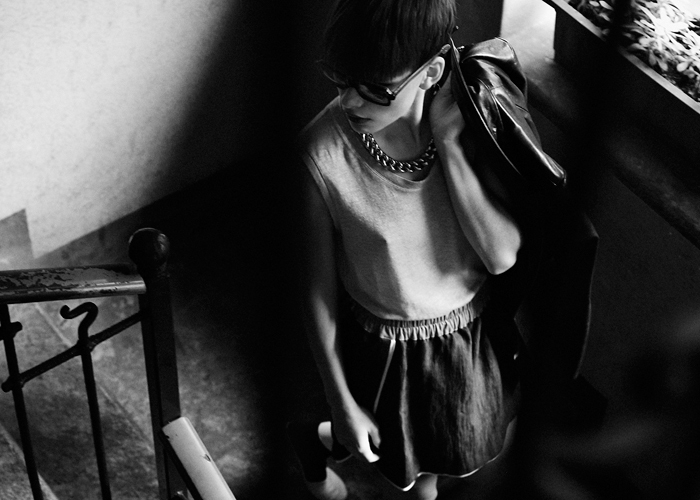 Top by Luca Larenza, skirt by Covherlab, handmade glasses by Ozona and necklace stylist’s own. Photography by Andrea Massari, fashion by Andrea Gasser, make up by Chiara Cima, hair by Marco Gamba@Greenapple Milano and modeling by Benthe De Vries@Img Milan. Special Thanks Sergio Faccin.